NOTES: Weekend Edition. It has parts for to make an Fw 190A-8, Fw 190A-8/R2, Fw 190A-8/R11 and an Fw 190F-8, but it lacks the late Fw 190A pitot location. From the instructions: "The second half of the Second World War saw the Focke Wulf Fw 190, in its various forms, emerge as the best of what was available to the Luftwaffe. The dedicated fighter version was a high performance, heavily armed machine. Its development had a precarious beginning, against a 1938 specification issued by the Technisches Amt, RLM. The first prototype took to the air on June 1, 1939. Large scale production of the A-5 was initiated in April 1943, with an identical wing to the A-4, but with a nose extension that would become standard on all subsequent Fw 190A versions up to the A-9, and also on the corresponding F types." As with every Eduard Weekend kit, it comes in a blue coloured top opening box that is way too large for the size of the sprues. The top of the box is decorated with Oberstleutnant Rolf Strohal´s Fw 190A-5, who was based at Deelen airbase in the Netherlands as part of the Stabschwarm 1 of the Fighter Wing 1 (Stab 1/JG 1) in April of 1943. 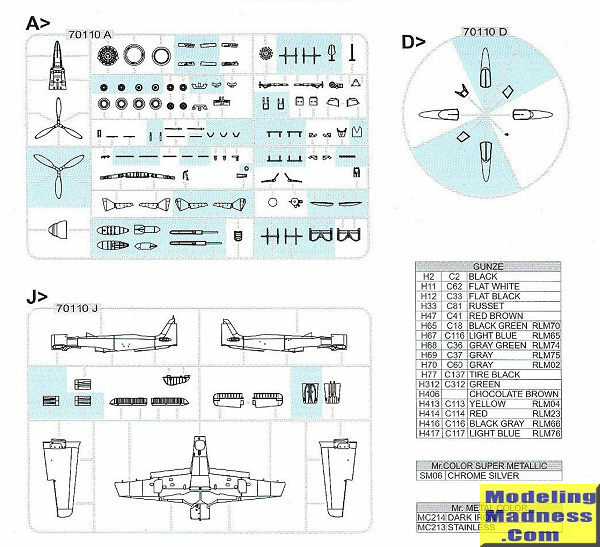 The sprues have 126 parts in total, 52 of them aren´t used (but can be used if you want to build the later Fw 190A-8, Fw 190A-8/R2, Fw 190A-8/R11 or Fw 190F-8 if you have the upper right wing with the late location of the pitot tube). The instruction booklet is glossy to the touch, has 12 pages in total, and is presented in black and white, showing in light blue where the parts go. Every part of the kit is beautifully molded, without any signs of moulding flash. Decals are provided for the seatbelts and for the control panel (its use is optional). The underwing comes as a single piece, which is later reinforced by a wing spar, something that will avoid having issues with the wing´s dihedral. Separate exhausts, alongside the front face of the engine, a well detailed cockpit (for the 1:72 scale) and a nicely done undercarriage, complete Eduard´s Fw 190A-5. 1) Fw 190A-5 "Black Chevron and Circle" flown by Oberstleutnant Rolf Strohal, Stab I/JG 1, Deelen, the Netherlands, April 1943. Its painted in RLM 04 (yellow), RLM 05 (white), RLM 22 (black), RLM 70 (black green), RLM 74 (grey green), RLM 75 (grey violet) and RLM 76 (light blue). The nose of this aircraft is painted in the black and white checkered pattern. This is the box art plane. 2) Fw 190A-5 "White Chevron and Bars," St ab JG 54, Pskov, Soviet Union, Spring 1943. Its painted in RLM 04 (yellow), RLM 61 (dark brown), RLM 62 (green), RLM 65 (light blue, for the nose cone), RLM 70 (black green), RLM 74 (grey green), RLM 75 (grey violet) and RLM 76 (light blue). This scheme should be tried with an airbrush, due to the complicated pattern of the camouflage. 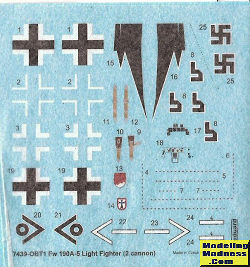 For 13,50U$D you get a nicely detailed kit of one of the early Fw 190s, together with several spares to make your own Fw 190A-8, A-8/R2, A-8/R11 or F-8. 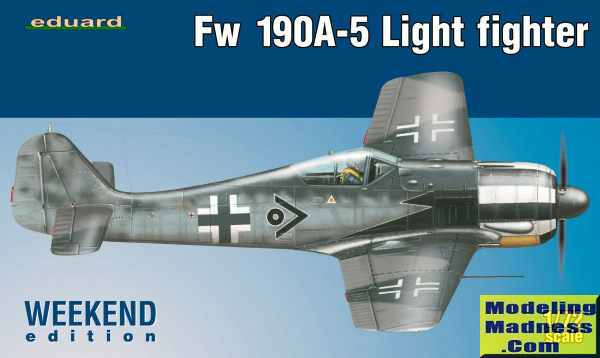 The later releases of Eduard´s Fw 190 (the dedicated A-8 and others) are vastly superior to Revell´s old Fw 190, which suffers from lots of flash and some parts that don´t fit very well. It should be a nice build and it should look good alongside other German fighters of WWII.